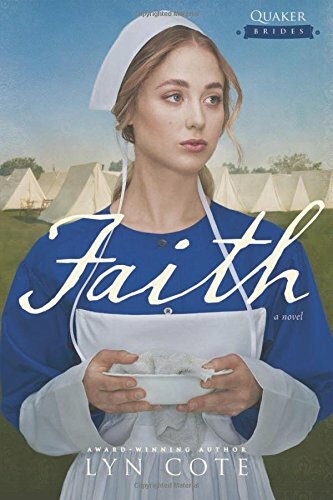 Faith Cathwell has one main goal when she volunteers to be a nurse during the Civil War and that goal is to find her best friend Shiloh. Shiloh is a free woman of color who was kidnapped five years before the war broke out and taken back to the South and sold as a slave. Faith, along with Shiloh’s sister Honoree, searched when and where they were able to do so, but were limited by fear for their lives as Faith is an abolitionist Quaker and Honoree is a free woman of color. Neither woman is safe alone in the South. They see their chance to get geographically closer to the South by volunteering their services to the Union as nurses, so they find themselves serving in an army hospital very close to the battles. They face disrespect and derision from many soldiers and doctors, but not all of them. Faith meets Colonel Devlin Knight when he comes to her asking her to tend his wounded cousin. He initially neglects to mention that his cousin is a Confederate soldier. In return for her help, Devlin agrees to help her search for Shiloh. As they spend time together on occasion, both begin to quickly fall in love. However, Devlin keeps a slave and just knows he is going to die in this war. Faith cannot tolerate slavery and doesn’t understand how Devlin can fight for the North, but still own a slave. Despite their attraction to each other, they don’t see how there is a future for them. Faith’s deep religious holdings are foreign to Devlin as he has distanced himself from God. This is another obstacle for them to overcome. As the war rages on the battlefield, so does the struggle within each of their hearts. I have thoroughly enjoyed each story in the Quaker Brides Series and encourage readers to get all three books. Each book can be a standalone story, but there are references to the prior stories. If you are like me and like to do things in order, then start with book one so you can get the background and history from the get go. I liked the setting and found reading about the Quakers very interesting. The romance in each story was clean, and I found the fortitude of these Quaker women amidst persecution and the struggles of life two hundred years ago or more was inspiring. The author has done her research, which made the story come alive for me as well as teach me something about this time period. I can’t wait to see what Lyn writes next! Disclosure of Material Connection: The above is my opinion only. I only recommend products or services I use personally and believe will be good for my readers.